Characterization of the new Pod-GCaMP3 mouse model and its utility for in vivo imaging of podocyte [Ca2+]i. 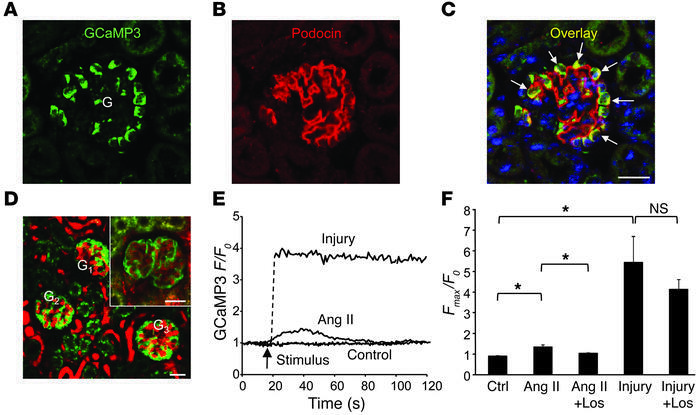 (A–C) Immunofluorescence double labeling of GCaMP3 (A, green) and the podocyte marker podocin (B, red) in a Pod-GCaMP3 mouse glomerulus (G). (C) The overlay image shows colocalization (yellow; arrows), confirming the podocyte-specific expression of GCaMP3 in Pod-GCaMP3 mice. Nuclei were labeled with DAPI (blue). (D) In vivo MPM image of the intact mouse kidney, showing the overview of podocyte-specific expression of GCaMP3 (green) in 3 adjacent glomeruli (G1–G3). A magnified area is shown in the inset. Scale bars: 20 μm. Plasma was labeled red with albumin–Alexa Fluor 594. Nonspecific green autofluorescence was visible in proximal tubule segments around the glomeruli. (E) Representative time-lapse recordings of GCaMP3 F/F0 in single podocytes in control and during bolus Ang II injection or laser-induced podocyte injury. When the laser was used to trigger injury, GCaMP3 imaging was paused; thus, imaging for the same podocyte was noncontiguous (dashed line). (F) Changes in podocyte GCaMP3 Fmax/F0 in response to Ang II (n = 15 glomeruli from n = 5 mice) or laser-induced podocyte injury (n = 21 glomeruli from n = 9 mice), either alone or with AT1 receptor blockade with losartan (n = 5 glomeruli per losartan group from n = 4 mice). Data represent mean ± SEM. *P < 0.05.